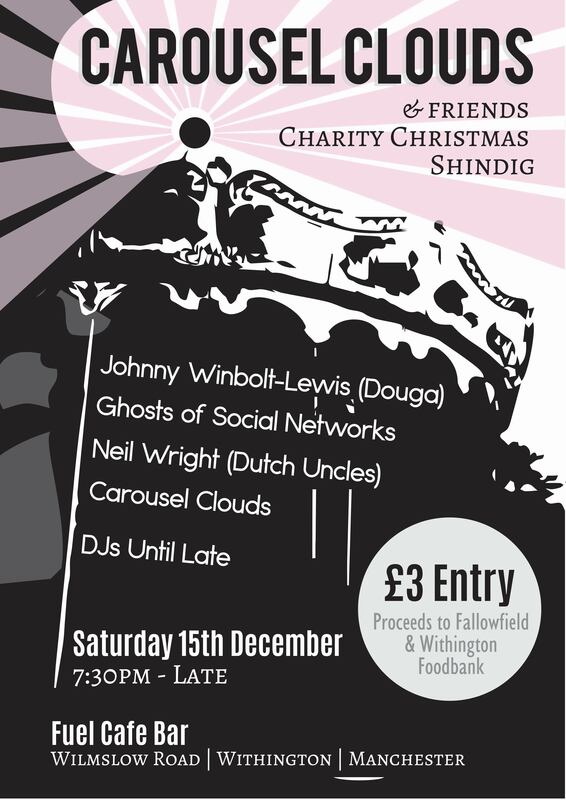 All proceeds to the Fallowfield and Withington Foodbank. Donations can also be made on the evening. Wilmslow road is served by busses 41, 42,, 42A, 42B, 43 and 44, plus 142 and 143 night busses. Nearest Metrolink stop: Burton Road. JOHNNY WINBOLT-LEWIS We were delighted to play with Douga at The Eagle, for the Invisible Lines single launch. Back at the Summer 2017 show, Douga played a completely improvised set. Since then, Douga have released wonderful second album Hidden Tapes and the Golden Tide, and vocalist & multi-instrumentalist Johnny is coming to play a set at Fuel this Winter, possibly with some special guests. NEIL WRIGHT After years of asking, Neil Wright exited his solo-hiatus to play with Carousel Clouds in August 2018, his first solo show in 6 years. Although he does perform regularly, as guitarist with Dutch Uncles, as well as hosting the ace Chips of Chorlton podcast. Neil previously also played with (52) Teenagers and The Alpha Machine, and we are extremely excited to see him perform from his exquisite back-catalogue for us again. GHOSTS OF SOCIAL NETWORKS A Manchester act we first heard when championed by Steve Lamacq, no less. Having since caught them live a few times, we cannot wait to see GOSN perform at the Christmas Shindig. SPECIAL GUESTS Be alert for some very special guests on the night!